This Tasmanian shy albatross is sitting on an artificial nest. The nests weigh between 12-20kg and are 45cm wide and 30cm high. The bird will share incubation with its mate for the next 70 days before the egg hatches. They form monogamous bonds and usually do not mate until they are eight-years-old. They lay a single egg each year, but most chicks will not make it to adulthood. These facts don’t bode well for the longevity of this beautiful seabird. Thankfully, science has stepped in and found that the quality of the shy albatross nest can play a big part in breeding success. 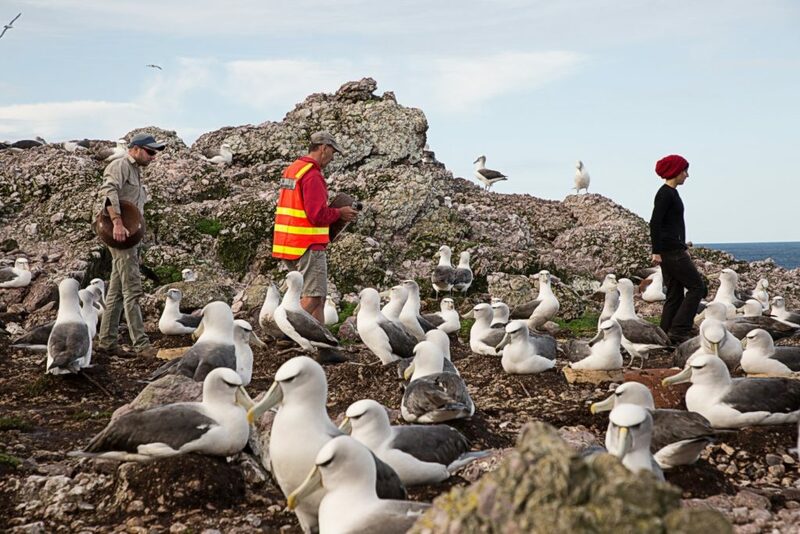 Over 130 high-quality artificial nests were recently installed on Albatross Island, in western Bass Strait, just in time for the start of the breeding season. Our studies have shown that birds with high quality nests have a greater chance of hatching an egg and producing a chick than poor quality nests. Providing artificial nests is one way of helping this population produce more chicks, which will be particularly important given climate threats. Climate change means that novel environmental conditions are being experienced by many species. The biology of albatrosses makes them particularly vulnerable. Their long life span and natural low reproductive rate of one egg a year limits the speed at which they can evolve and adapt. Their fidelity to their island breeding colonies means populations cannot readily move when the environment becomes less favourable. Our aim is to develop a series of low-impact, efficient and effective actions that provide the species with greater resilience to climate impacts. We want to have a tried and tested tool-kit ready to go, before the population declines to critical levels. Artificial nests are one promising approach, and following a small trial in 2016, rigorous testing was approved. How do you make an artificial nest? One hundred of the nests are constructed from Hebel®, which is a light-weight concrete block, and the other 36 nests are made using mud-brick techniques. The construction of the concrete block nests took a dedicated team working over several months. Pallets of blocks were delivered to us months ago, with pairs of blocks cemented together to approximate the diameter of an albatross nest. Several test nests were hand carved but making 100 required machinery expertise. Nest bowls were bored with a specially constructed cutting tool, before a water cutter shaped the outer dimensions of the nests. Final shaping and colouring was carried out by hand, with a small team spending a day crafting the nests. Careful packaging onto pallets was critical to avoid damage during the five hour drive to Woolnorth in north-west Tasmania. Nests were flown to the island by helicopter, with Parks staff providing logistical support and nest transport, before finally placing the nests into the colony. Over the next six months, the progress of birds on both artificial and natural nests will be monitored using our Ruggedised Autonomous Gigapixel System (CRAGS) . This will provide high quality photographic images in which the fate of individual nests can be tracked. 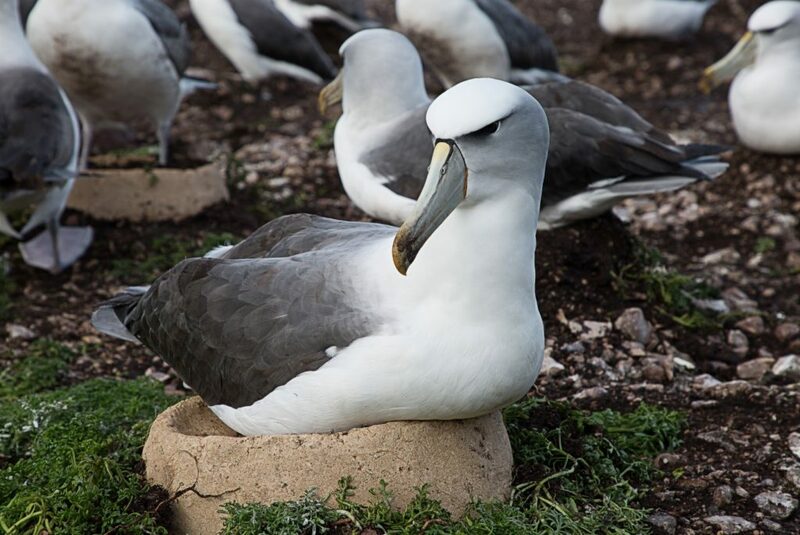 If shy albatross breeding success is higher on these artificial nests, then conservation managers will have another tool to consider using when climate threatens the persistence of this species. 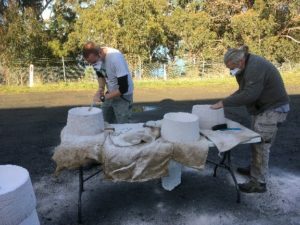 This research project is led by DPIPWE and CSIRO and supported by the World Wildlife Fund, The Threatened Species Commission, and the Tasmanian Albatross Fund. The authors were supported by Leigh Roberts, Chris Blood, Craig White, David Kruse, Chris Cvitanovic, Ross Monash, Isabelle Bond, Jordy Monash, Duncan and Margot Hobday, Matt Lansdell, Toby Travers, Pete Hefferon, James Grey, Ben Hill, Tasman Helicopters, Clare Mason, UniqueEarth, and Menzies Medical Research Facility. Ethics approval was granted by the DPIPWE AEC. Our remote, self-waking, gigapixel camera can be deployed in the harshest of environments. 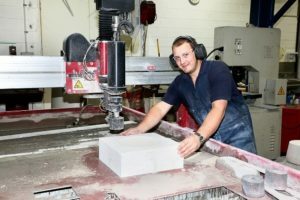 Thanks – we did try 3D, but the size of the nest and amount of material required is cost-prohibitive compared to the Hebel. we did use a 3D printer to make a couple of albatross eggs for use in education. Congratulations on a wonderful idea and great effort to test and monitor the outcome. Please extend the project to include Campbell Island and Macquarie Island, to protect these lovely birds and encourage their breeding success, now the rats, cats, rabbits, sheep, goats etc have been removed. I could watch them all day. Thank you for your dedication in helping endangered species to survive. I think this is a fantastic project. Fingers crossed that the nests make a difference for this lovely bird. Congratulations to all involved.